January, Tuesday 13. 1885. 1st Natl. Bank Annual election Pay Life Ins. Pd Wm Young painting porch floor $3.50 Pd Oysters .30 Cold Dub. Co Bk meeting I was elected Director in 1st Nat. Bank. & Dubuque County Bank. Wednesday 14. Annual Stockholder meeting Gas Co. 3 PM Pd Market .90 Pd Simplot 6 pr Shirts & gave Ben. 3.80 Pd Subn. to Times to Jany. 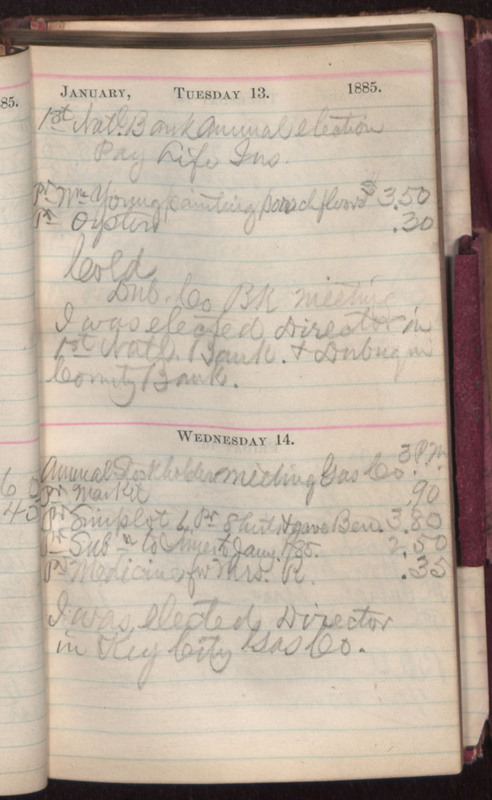 1/85 2.50 Pd Medicine for Mrs. R. .35 I was elected Director in Key City Gas Co.